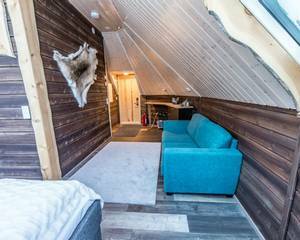 Enjoy a free upgrade to experience one night in an Aurora Cabin if you book to travel in September, October or November. Quote 'FREE CABIN NIGHT' when you book. There is something special about turning off the main road and heading through the snow-laden forests and across the gentle fells to reach Muotka. It gives you a sense of being wonderfully removed from the outside world. 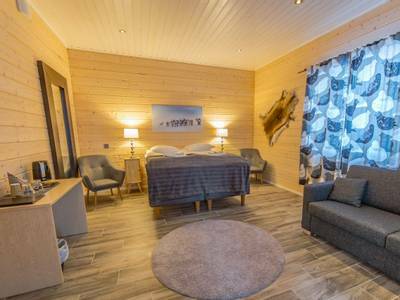 This trip provides an excellent base from which to explore the beautiful scenery of this corner of Lapland, take part in truly memorable activities and search for the Northern Lights in a dedicated, yet relaxed manner. As one of our more gentle holidays this trip allows guests to experience the real highlights of this remote and spectacular region in a more relaxed fashion. 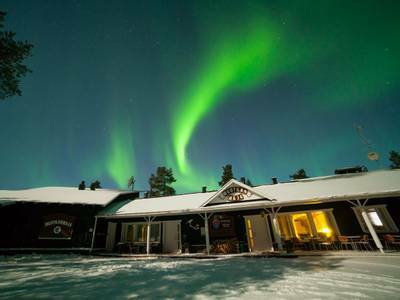 Your evenings are still dedicated to the quest for the Northern Lights but your days offer exceptional experiences and activities, as well as time to enjoy the peace of Lapland. Muotka is simply delightful. 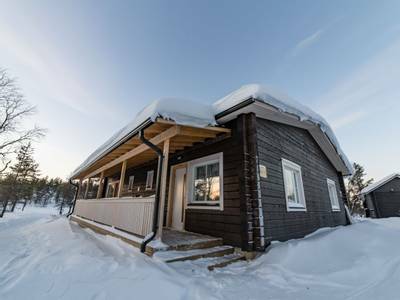 This small and remote lodge is surrounded by the forests of North East Lapland. 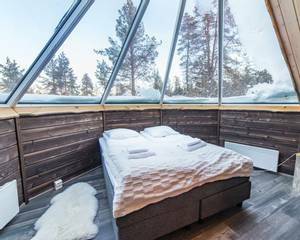 The region is a veritable feast for anyone looking to enjoy a comprehensive experience of Lapland whilst looking for a retreat from the every day and a more relaxed pace of life. You will enjoy true 'bucket list' activities such as an unforgettable dog sled safari in the wilds of the Arctic and an exciting snowmobile safari to the fells. Your evenings are dedicated to the hunt for the Aurora Borealis and these excursions typically use engines to do all of the hard work, allowing you to focus on the task at hand. 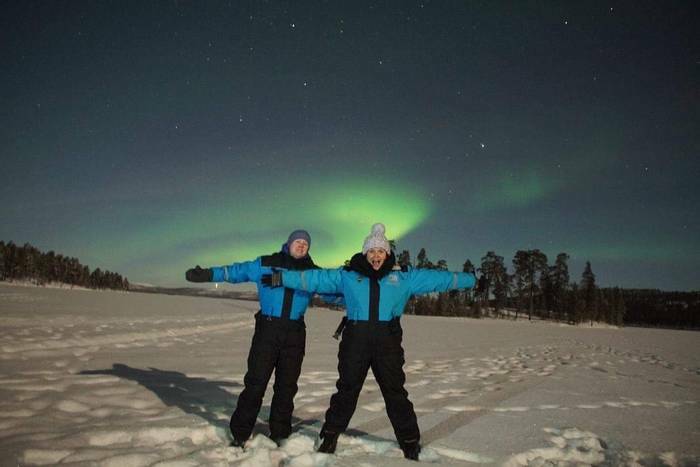 During two evenings you will hunt for the Northern Lights using the mobility of a minibus. Your expert local guides will use their incredible local knowledge and the latest weather forecasts to aid your search. 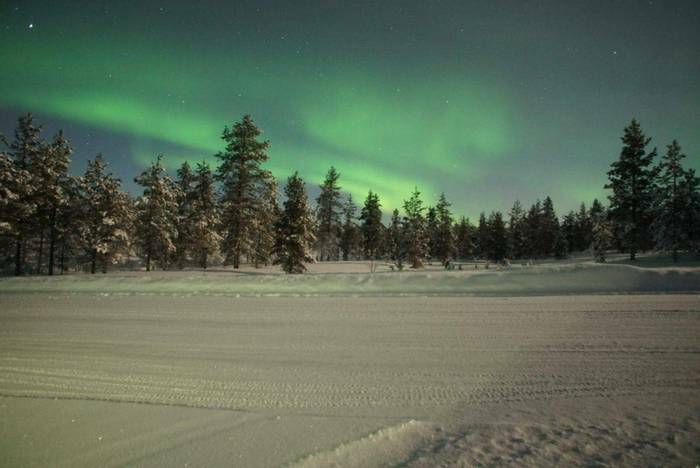 Your third Aurora evening uses a snowmobile-pulled sleigh as your method of transport as you will be heading out to one of the Aurora camps. 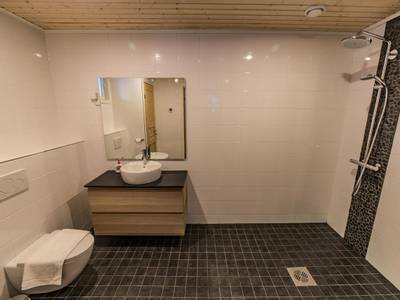 We can also arrange for you to upgrade to the epitome of Aurora accommodation for either part or all of your holiday and book you into one of Muotka's wonderful Aurora Kotas. Details of all of these special upgrades can be found in the 'Accommodation' and 'Personalise' sections of the holiday page. Upon arrival at the airport, you will be welcomed and then transferred* to Muotkan Maja Wilderness Lodge. The lodge has a beautifully remote feel and provides the ideal base for a Lappish adventure. 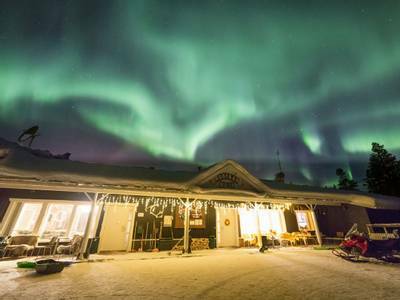 On your first evening, you will be provided with your cold weather clothing and Aurora alert. After dinner, your Northern Lights quest gets underway with your inaugural Northern Lights hunt. The guides will drive you to a potential vantage point, utilising their local knowledge, weather and solar forecasts. * Transfers are based on a scheduled group shuttle to a few nearby hotels. If you would prefer to upgrade to private taxi transfers please ask our Travel Experts for a quotation. 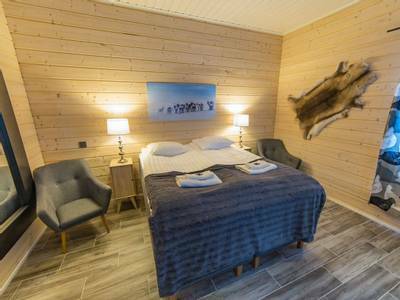 Today, you will be trying out one of the most memorable activities in Lapland, as you participate in an exciting husky safari. 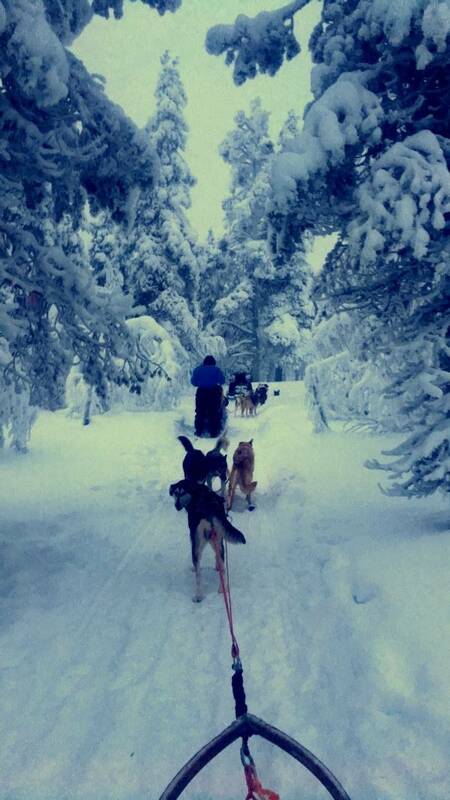 Guiding a team of huskies is almost always one of our guests' favourite activities and is a truly unique experience. Travelling in this traditional fashion gives people a wonderful connection with the Arctic environment. Once the dogs have calmed their initial excitement, it is a remarkably peaceful activity as the dogs pull you through this winter wonderland. Before setting off, you will be given full instruction and will travel two people per sled with the opportunity to swap drivers during the activity so you can both experience the thrill of being the musher, and the joy of taking in the scenery as a passenger. Lunch will be served at the camp. Today your guide will introduce you to the Northern Lights and some of the myths and legends that this phenomenon has inspired over the centuries. 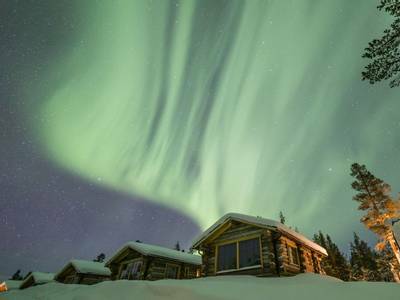 Your guides are all locals and their knowledge of the area and the Northern Lights is exceptional. After dinner, you will head out on another hunt for the Northern Lights. 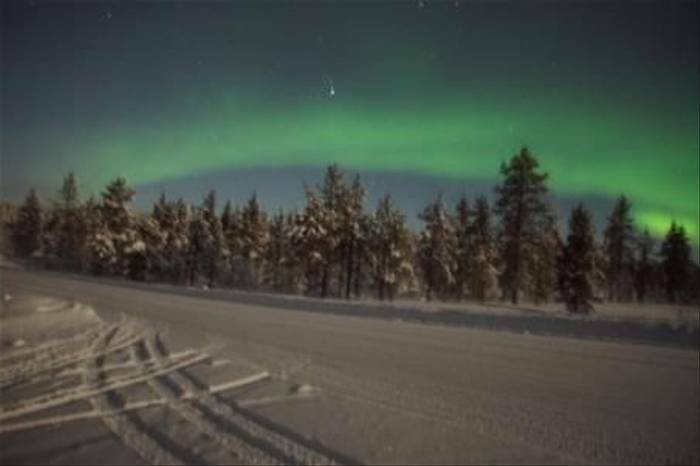 You will travel via sled pulled by your guide's snowmobile to one of the Aurora Camps, which offer excellent views of the vast night sky. If the solar conditions are favourable, and there is no cloud cover, then you will hopefully see the Northern Lights dancing overhead. This morning, you will travel two people per snowmobile and journey through snow-covered forests and over fells during this thrilling and exciting snowmobile tour. After a full safety briefing and instructions on how to drive and handle the snowmobile, you will head out for a snowmobile safari lasting approximately four hours. You will have the chance to swap seats and each take a turn at driving (the driver must hold a full driving licence). This afternoon will be free to relax before dinner. 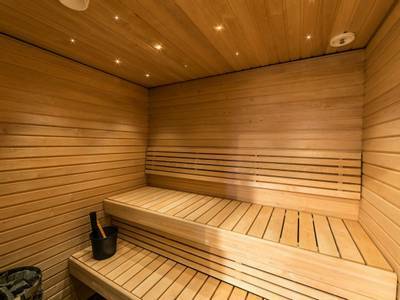 You may wish to take advantage of one of the hotel's saunas. 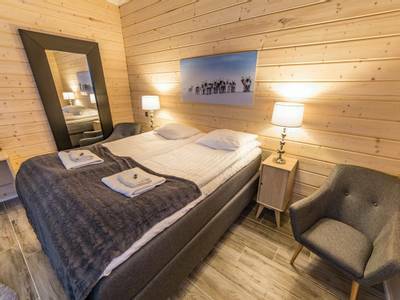 There may also be additional activities which can be arranged locally and snowshoes can be hired should you wish to explore independently. Your guide will take you out via minibus once more for your final Aurora hunt tonight. They will be armed with solar activity data and detailed weather forecasts to pinpoint the best directions and locations to view any potential Northern Lights display. Today is departure day and you will be transferred back to the airport to catch your return flights. If you are on an early flight, which takes off at 6 am, a packed breakfast will be provided. If you depart on a later flight, you will have breakfast in the restaurnat. 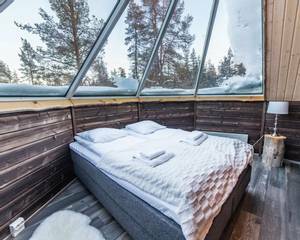 Muotkan Maja Wilderness Lodge resides around 40km from the main town of Ivalo, tucked away in the corner of North-East Finland. 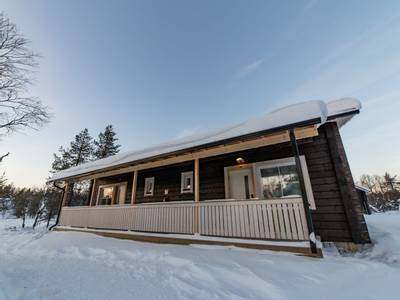 Recently renovated and restored it is owned and run by the same couple as the popular Nellim Wilderness Hotel, Mari and Jouko Lappalainen. They run the lodge with the same hard-working ethos and it exudes the same warmth and charm for its much-welcomed guests. 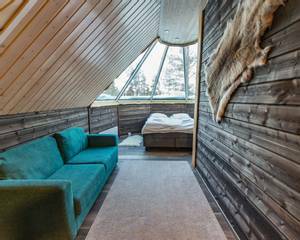 The lodge boasts some wonderful scenery, tucked away in the forested-fells with roaming reindeer frequently seen amongst the trees. 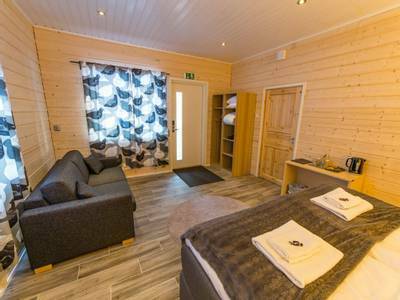 It consists of two main accommodation buildings, one with the majority of the bedrooms and another with hosts additional bedrooms, the main restaurant and the reception area. Hairdryers are available from the main hotel reception. Please note an additional supplement will apply on our Christmas and New Year departures and that all prices are based on guests spending their final night in a Kota and checking out of their hotel room the day before departure. It is obvious that a lot of effort is put into taking visitors to places where there was maximum chance of seeing them. We liked all the other activities and we liked the combination of physical activities (cross country skiing) and less energetic activities, like snowmobiles. The huskies were great, as usual. The husky safari was great. Something totally different to the norm, the right balance of adrenalin required to turn fear into excitement and enjoyment. An added bonus is the beauty of the otherwise inaccessible routes you get to see. The whole experience was fantastic with excellent guides and informative staff. An excellent holiday with good food and good equipment provided. Booking and information provided was very good. Overall an excellent trip; we saw the Aurora every night - it was magical. The guides at Muotka were fabulous, friendly and helpful. The hotel was warm and extremely comfortable, with great staff. Read more - some of our friends have already booked on this on our recommendation! The whole experience from location accommodation and activities were beyond our expectation. I really hope to use you again. It was a fabulous holiday in every respect. Seeing the northern lights was amazing! I did this trip by myself but felt extremely welcomed by friendly staff and met another girl travelling by herself as well. Someone dared me to go into the icebath so I did. ????? I would recommend this trip to everyone! My favourite part was sledding with the huskies. ? I could have done that all day! The huskies and skidoos were fantastic. Well organised, great guides. Read more extremely skilled in assessing the group and making sure everyone was comfortable with the level of activity without making slower or less fit members feel they were holding the group up. They also went out of their way to answer questions, lighten the moment and make sure everyone got maximum value from the experience. Read more was so well planned out. All the staff were friendly and helpful, full of advice. This was from the moment I booked the trip to the driver that took us back to the airport. What a fantastic team of professional people. The activities i.e. snow mobiles which we paid extra for as it wasn't part of our trip, snow shoe safari in a snow storm in the Pallas National Park, the husky trip, and the ice fishing were made even better (if that is possible) by the fantastic guides we had they were knowledgeable enthusiastic really helpful and fun to be with. The staff in the hotel were also really great as well. Everything was done well and the log cabin was very good! The guides were excellent. Very helpful and kind. Read more see anything) because the scenery was so beautiful and nothing like I've ever experienced before. The guides are helpful, enthusiastic, friendly and knowledgeable. We don't think there's anything you could improve on. 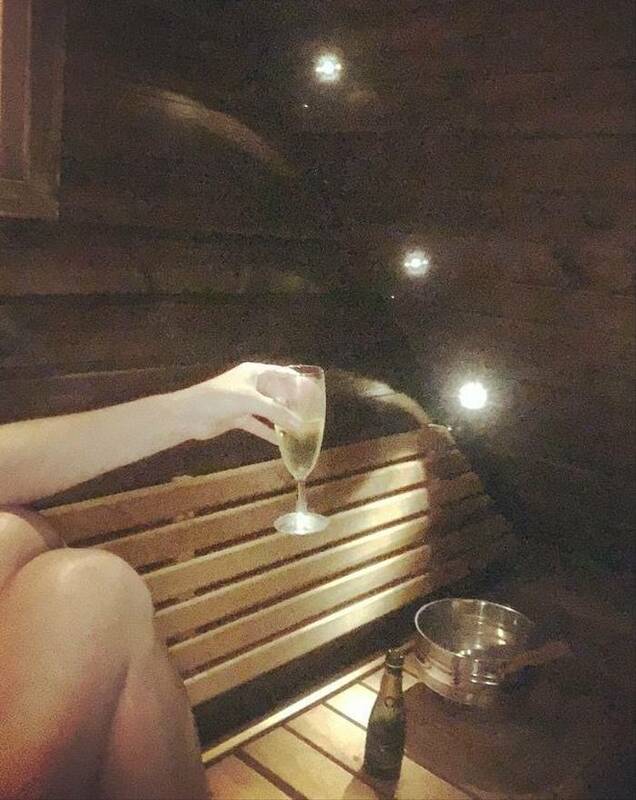 The Kota and sauna were spot-on and the champagne was a nice touch. We slept really well as the bed was very comfortable. The clouds pictured were polar stratospheric clouds which I'm told are highly unusual and was a real highlight of the trip as the locals ran out and grabbed their cameras to see them. Read more returned from the most magical, unforgettable holiday. Read more with Juoko, with the huskies a very close second! All were brilliant and amazing!! All of it was exceptional and enjoyed them all! We have travelled to many places but for such a short trip every day was filled with the most amazing experiences ticking many of our bucket list items!! It completely surpassed all of our expectations. We really had no idea what to expect and strangely the Northern Lights became secondary! However, we loved seeing them even though they weren't that spectacular because of the cloud cover but because of the other trips we weren't as disappointed as we thought we might have been when we first arrived. What a magic experience. Even though the Aurora Lights did not appear the package was an excellent offering. I would have stayed an additional day, time allowing, to experience the snowmobile ride. The husky dog sled ride was top notch. To be in charge of a team of six huskies was an experience not forgotten easily. Really found the staff at the hotel delightful. They were enthusiastic, knowledgeable, hard working and seemed to be able to turn their hands to anything that needed done in the lodge. I'd go back like a shot for a longer time. Loved all activities, best was probably husky sledding which was much more fun than expected and none of us fell off! Couldn't have asked for a better trip - well-organised, lovely staff, comfortable accommodation, great activities and three sightings of the Aurora. Perfect balance of activities and time to relax. 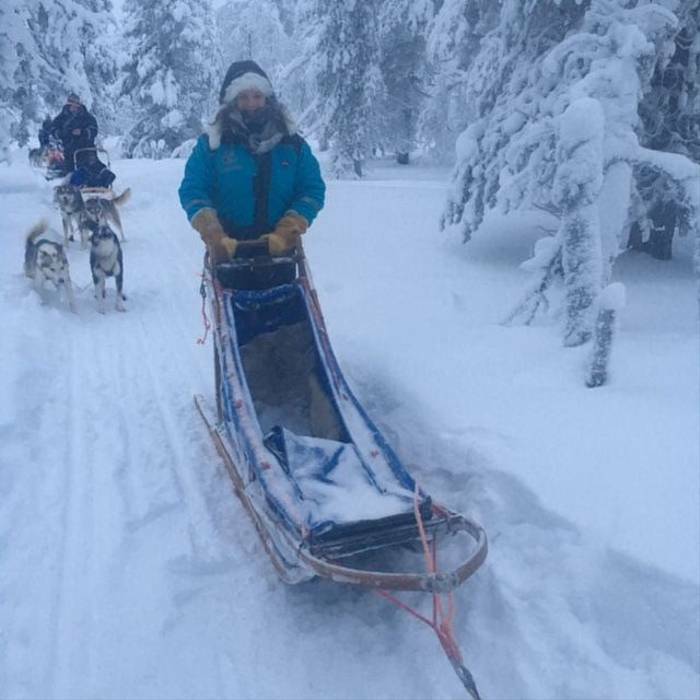 Read more we particularly enjoyed the Husky sledge driving. Red squirrels appeared outside the window most mornings whilst I was eating my breakfast and they were absolutely enchanting and quite different to our red squirrels. We were very impressed by our guide Santo - his knowledge of the area was encyclopedic and he worked tirelessly, indeed I'm not sure when he slept. All of the staff could not do enough to help - we were really impressed - the additional outer clothing provided was great and absolutely essential. All in all it was just fabulous and I really hope to go again! Overall an excellent holiday. We saw the Aurora twice, the second time a fantastic display. Read more sky somewhere in Finland! We travelled even to the Russian boarder for a view. 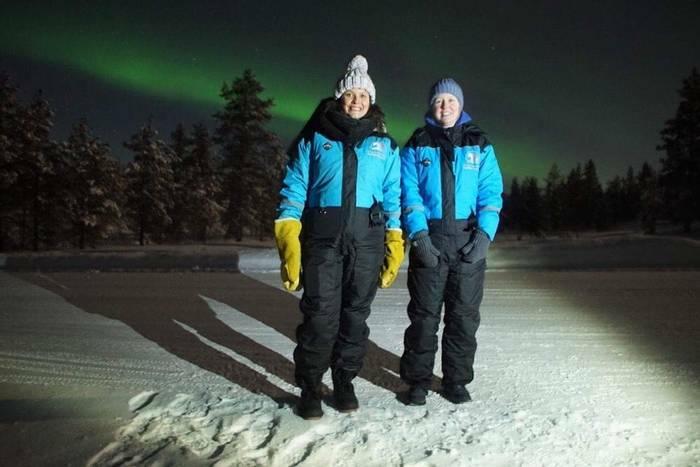 On our last night the skies cleared and Noora, our fantastic guide, took us up to an area in the North which provided us with the most stunning views. I think the Aurora spirits were on our side, as it was my birthday, and what a display we saw. Noora took many photos to include us in and made these available to us afterwards and these will be treasured by us all. Please pass on our many thanks to your team and to all those involved at the Wilderness Lodge, Finland, especially Noora. Read more parted and the Northern Lights danced across the sky for us, both at the lodge and up on the fell at Kiilopaa - we stayed out on our last night until 2.30am in termperatures of -17c and it was well worth it! The accommodation was modern and comfortable, the food was tasty, plentiful and warming - just what we needed to keep us going! Read more suit everyone. We were lucky to share the trip with a great group of like-minded guests, and it was a pleasure to chat to them around a blazing fire over a cup of hot berry juice. Particularly special was snowmobiling through the starlit forest at midnight, as it was unlike anything we'd done before! Being propelled through a sunlit forest by enthusiatic huskies was equally thrilling! The husky rides were just fantastic. Even better when we got to hold the husky puppys. There wasn't anything that I didn't enjoy, or (would) change.